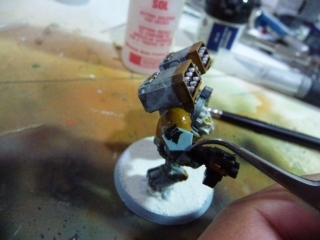 My Warhammer 40K armies incorporate intricate designs and I’m often asked if I free-hand painted them. Sadly, the answer I have to give is that I did not. They are decals. The inevitable question then arises, “Wow! How did you get them to look painted on?” This, my friends, is my method. My two primary secret weapons are the compounds Micro-Sol and Micro-Set. Other companies, such as Testors, make comparable products but I’ve gotten the best results with these. If by some ill luck you can only get your hands on one of them, Micro-Sol is the one to grab. 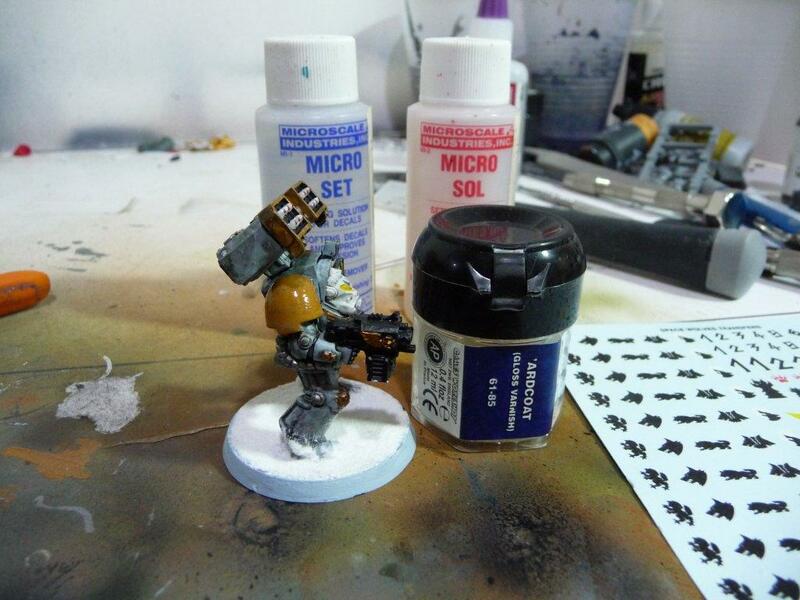 STEP 1: Paint your miniature. 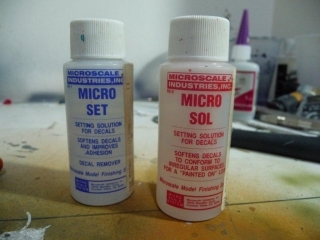 This may seem obvious, but really the decal stage is nearly the final stage of finishing your miniature and we’ll soon see why. 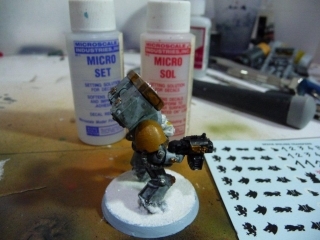 On the miniature below, I used an already finished miniature for this tutorial and painted over the design I had on the shoulder pad. As you can see, I just slathered on some foundation paint and it isn’t even a particularly smooth paint job. Worst case scenario really, but it won’t matter, we’ll fix it in the next step. STEP 2: Apply a thick gloss coat to the miniature where you want the decal to go. In our example it is the terminator’s shoulder pad. 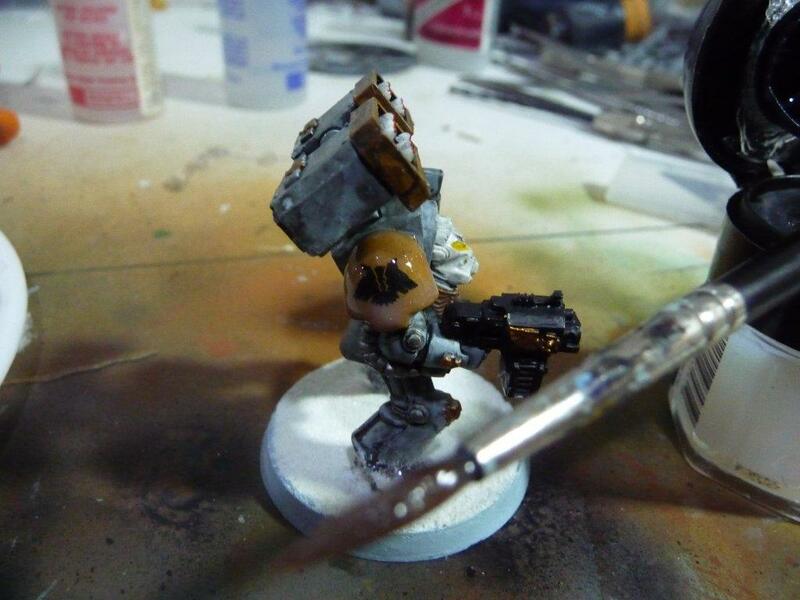 I like to use a brush on gloss coat here so that I don’t have to apply it to the entire miniature. I like to use GW’s ‘Ardcoat for this step, but just amount any gloss coat will do. Allow the gloss coat to dry completely before proceeding to the next step. STEP 3: After your gloss coat is fully dry, we’re going to prep the decal. 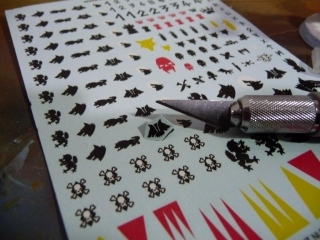 Using a hobby knife, cut the decal free from the decal paper. 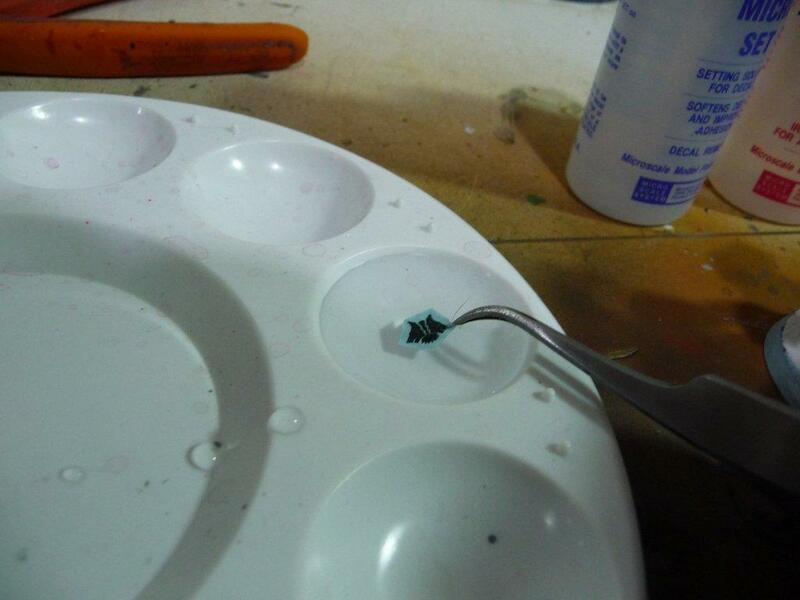 STEP 4: Using some hobby tweezers, lay the decal in some water to soak for about 30 seconds. Don’t leave the decal in the water so long that it comes off the backing paper. (If that happens, don’t panic, the decal is still usable, it might just be a little harder to put into place). STEP 5: While the decal is soaking, take a light brush full of MICRO-SET and put it on the surface you want the decal to go. This will do several things. 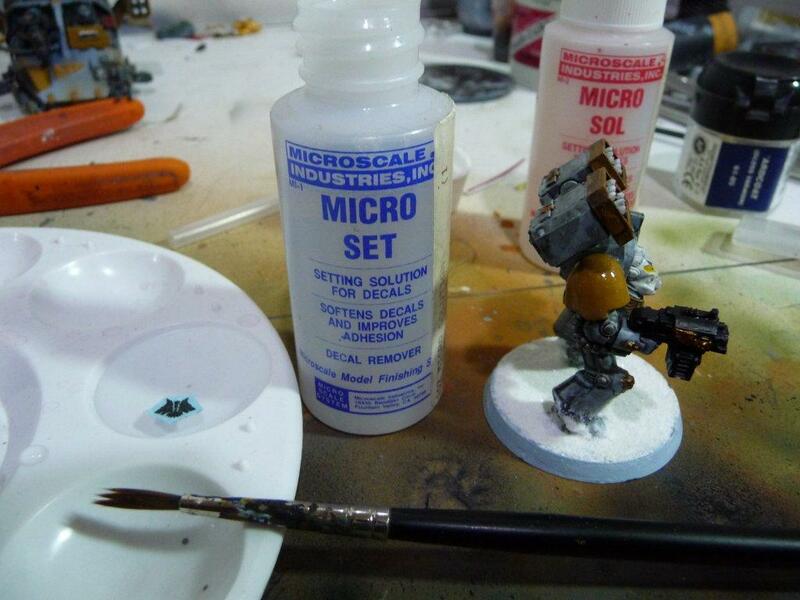 First it will provide a wet surface for you to more easily slide the decal over the surface to position it correctly. 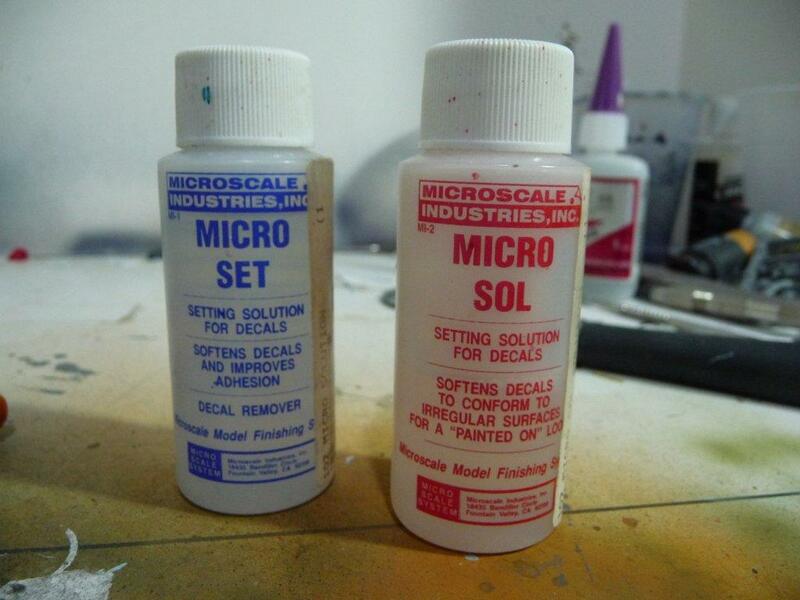 And secondly, Micro-Set, is a similar compound to the adhesive on the decal, so it will help fix the decal in place once you have it in position. STEP 6: Using tweezers to hold the decal paper, use a brush to gently sweep the decal off of the paper and onto the end surface. Use light touches of the brush to slide the decal around into the desired position. Try an avoid wrinkling the decal at all cost. 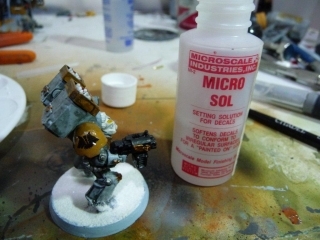 STEP 8: Once your Micro-Sol coat is dry and the decal looks the way I want, I apply another gloss coat. This serves two purposes. It further helps to blend the edges of the decal, if they are still visible after the Micro-Sol and it helps protect the decal. Let this stage dry thoroughly. 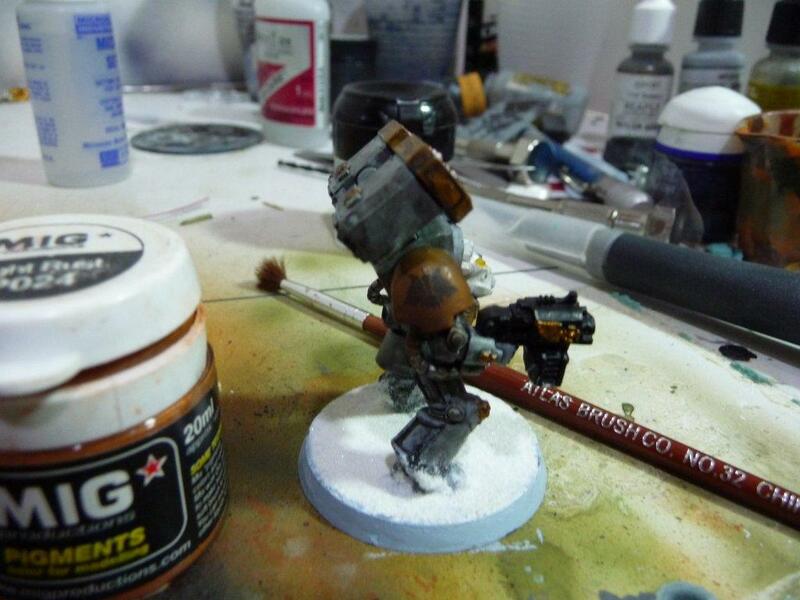 You could call it quits here if you wanted to and just apply your normal Matte sealer coat to the entire miniature. It depends on the look of your miniature and what end result you want. STEP 9: This step isn’t entirely necessary, but it’s what really helps sell the decal as something real and not just a decal. 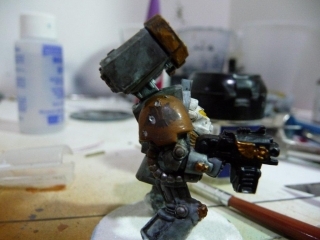 Weathering and distressing. 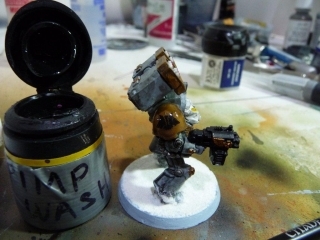 Here is where you want to apply a wash over the top of the decal and maybe even use chipping methods or weathering pigments to further blend the decal into the miniature. Once all that is done, apply a matte coat to the whole of the miniature and you’ll have a perfect looking decal! 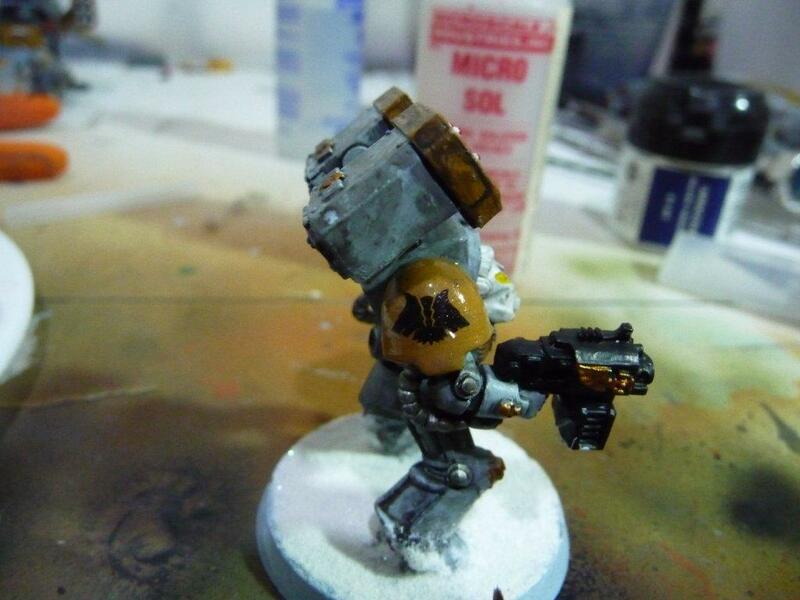 Below, you can see the final result, after I’ve added some bolter round strikes and some chainmail and mithril paint. You can still see a wrinkle in the decal, but again, this is because I rushed the process. I could still salvage this by using a small pin and pulling the wrinkle away, further distressing the decal. There’s lots of things you can do if things don’t go exactly right. But with a little patience and some Micro-Sol, you can get a lot of use out of decals for unit markings, chapter insignia, and if you delve into making your own decal sheets, almost anything your imagination can come up with. Thanks for the step by step. I have had some of the Vallejo brand decal fix and decal set and havent been able to effectively use them. I will have to give it a try with this tut in mind. Happy to help. Let me know what results you get.